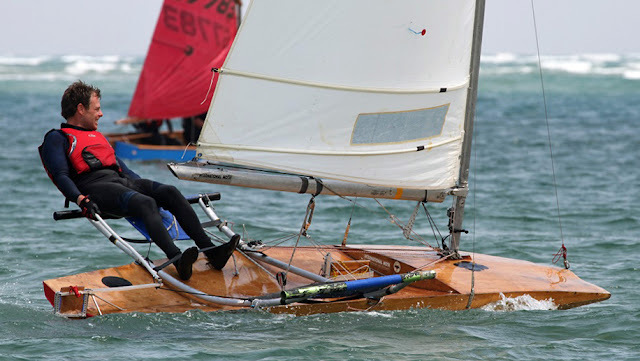 Forgive me dear reader but as I struggle to get out of this winter, I'm persevering by watching videos featuring sailing fails. There being 3 recent (youngsters flopping over -and over, Lightweight Sharpies at the jibe mark, and the video of the best of sailing fails of 2015) - this fourth in the series is of a Europe dinghy skipper who has great fun blast reaching back and forth but also has an affinity for getting hit in the head with the boom and rolling his Europe dinghy into the drink at the most inopportune times. 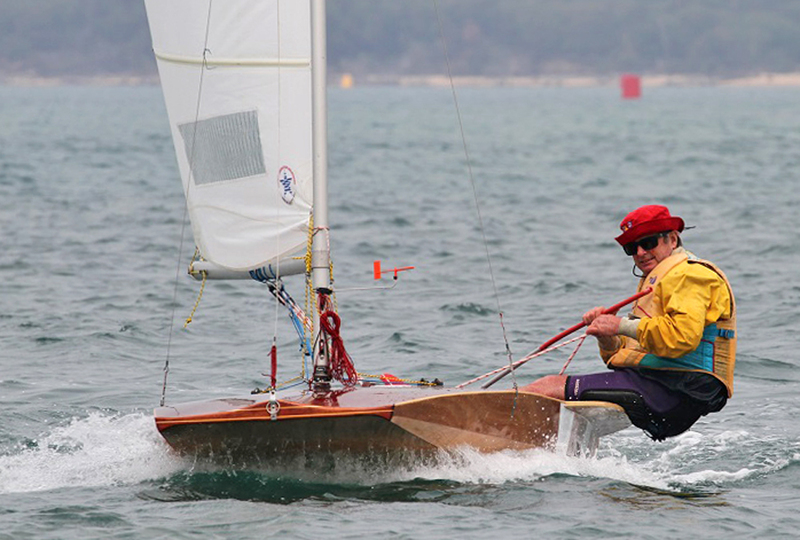 As promised in a previous post, Andrew Chapman sent over a slew of photos taken by Tim Wilson of the 2016 Aussie Classic Wooden Dinghy Regatta. 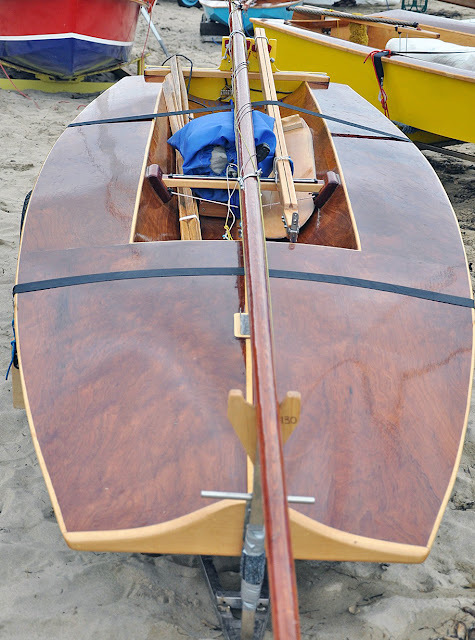 Inverloch, where the regatta is held, is the home of the Australian scow Moth (Len Morris with his Olive - 1927) and at this year's regatta there was a good turnout in the scows. Phillip Johnson's ‘Frolic’ [was] built in the early 60s. Jim French’s ‘Skeeta’ [is] a 1965 boat. 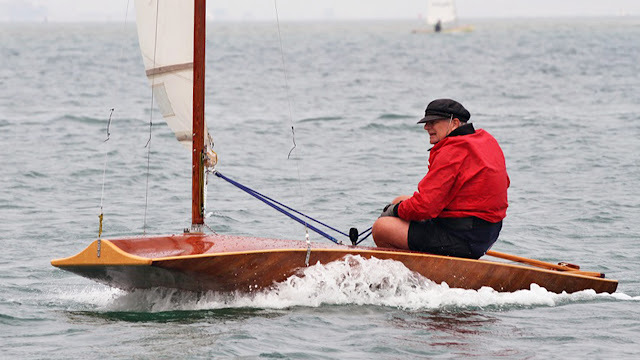 Jim is a fairly famous Moth builder and sailor and is the person who developed the scow on foils. My ‘Blondie’ - about early 60s or could be late 50s. The sail numbers do not necessarily indicate a clear progression in design. 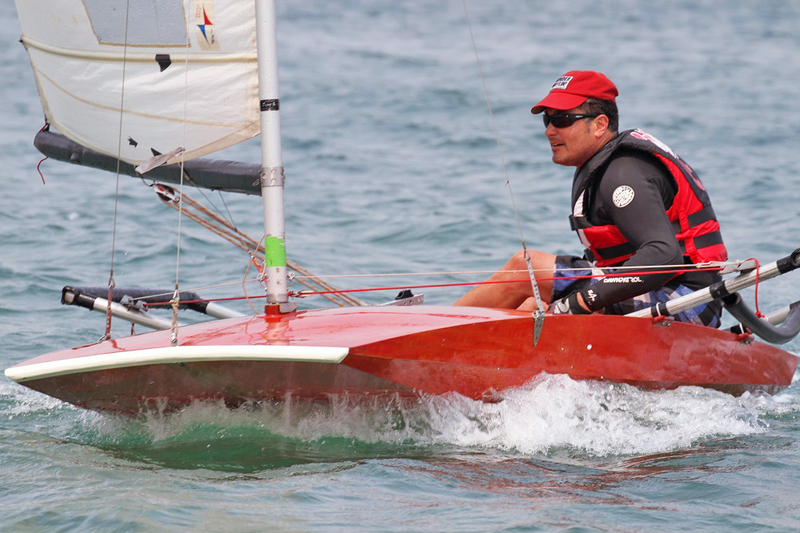 Jonathan Parise’s 1970s ‘Red’ is a winged Western Australian boat. A beautiful boat to sail and Jonathan is just learning to sail it and loving every minute. Mark’s [Rimington] Maggie, which you know a bit about. Graham Cooper’s unnamed boat that does not have a sail number. Its design is very similar to ‘Blondie’. Matt Kiely’s ‘Street Fighter’ which is another Western Australian boat. Like ‘Red’ it is very light and quick. Matt Kiely on Street Fighter. 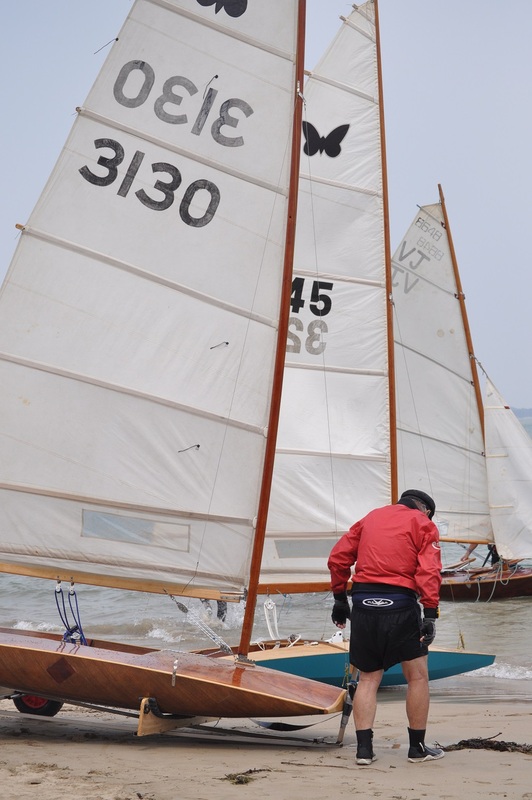 Maggie was a 2015 build of the classic Imperium design and was featured in last year's Earwigoagin post on the Classic Wooden Dinghy Regatta. Scows launching. The Mouldie in the foreground. The Mouldie or Peter Cole designed Mouldie. They were built with super-thin veneers and thousands of staples. The restoration of this one entailed regluing a fair amount of the veneer back in place. The Mouldie under sail. Look at that snout! Street Fighter rounding a mark. "Ah, memories.......after crewing Sharpies on Lake Illawarra, I moved to Sydney to work at Miller and Whitworth's new chandlery and boat store at Rochdale, where we sold the De Havilland Marine built, Alan Payne designed range of fibreglass boats - the 16ft Corsair, 12ft Vagabond, and the 10ft Gypsy. During this time I built my first boat from a kit - a Cole scow Moth, with not much more than a Black and Decker drill and a stapler. Loved it - so fast, couldn't believe the acceleration....sailed it on Botany Bay, and at Connels Point Sailing Club just inside the Georges River. Used to get regularly beaten by the 14 yr old kids - Aussie kids in those days were super fit from swimming and surfing. Great fun in videoland when the drone operator is an experienced dinghy sailor and knows the best footage in a breeze is always at the jibe mark. The Australian Lightweight Sharpies are 19' (5.8 meters) long, crewed by three (one on a trapeze) with a symmetrical spinnaker. The Aussies used the hull from the 12 sq. m Sharpie but redid it in plywood in the 1960's, reducing the weight considerably. The rig was updated from a gunter to a modern full battened main with aluminum mast. One takeaway from the video is how impressive is the wake from a full-on planing dinghy. TOH to Jim Champ who posted this video to the Yachts and Yachting forum. Earwigoagin archives has another Lightweight Sharpie video. 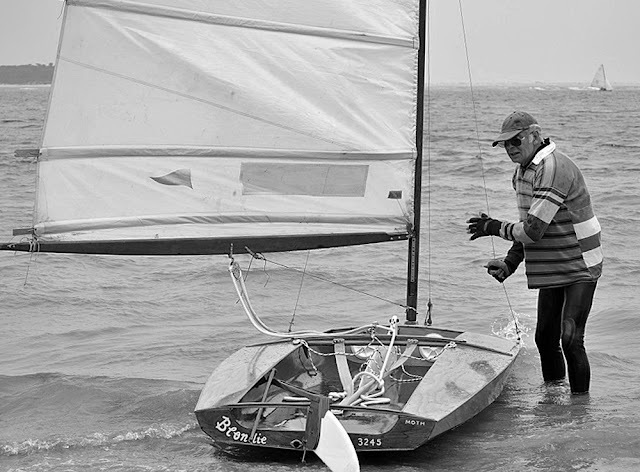 "When I emigrated to the Antipodes as a "Ten pound Pom' in 1965, I sought out my local sailing club - Lake Heights Sailing Club. Classes sailed there were OK dinghies, Lightweight Sharpies, and sundry others. "As I had no money to buy a boat in them days, I volunteered my services as crew aboard a Sharpie. What an eye-opener that proved to be for a British kid used to sailing little dinghies on ponds and rivers!! I was sheet-hand (mainsheet trimmer, and spinnaker raiser/trimmer), and those boats could really fly. Faster than a Dutchman, 505, or Fireball, it was a blast, and the thing I most remember being how warm the water was! Very wet boats, one was completely drenched on a planing reach, as you can see from the video. Occasionally we'd be out in the middle of Lake Illawarra, where the club was located, on a hot sunny day, when the clouds would gather on the horizon, and a Southerly Buster would come screaming across the lake, flattening the fleet, and forcing a rapid and hair-raising ride back to the beach! "I don't think they are the most popular trapeze dinghy in Oz - the skiffs probably have a bigger following 14ft 16ft and of course the 18ft-ers. 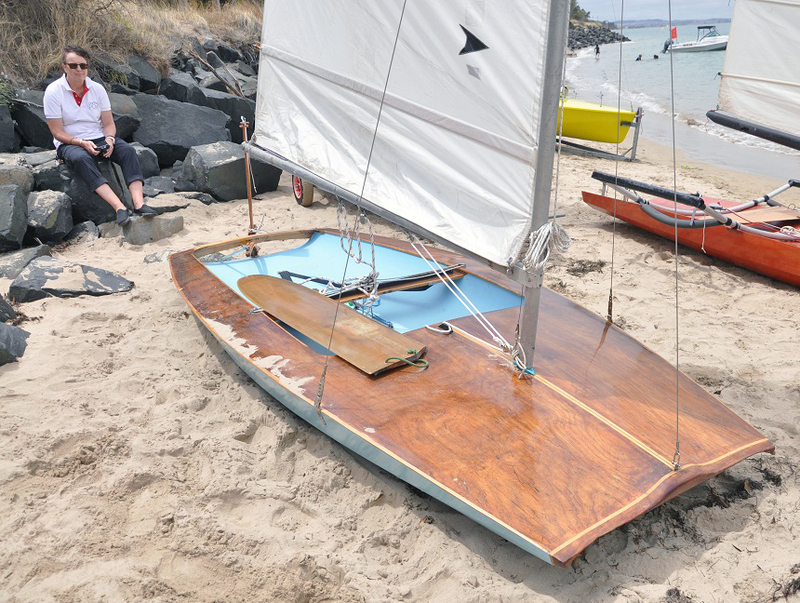 The previous header photo was of Australian sailing dinghies gathered on the beach for the 2015 South Gippsland Y.C. Classic Wooden Dinghy Regatta, ICWDR. In the foreground we can see, from left to right, a Mirror, and two scow Moths. 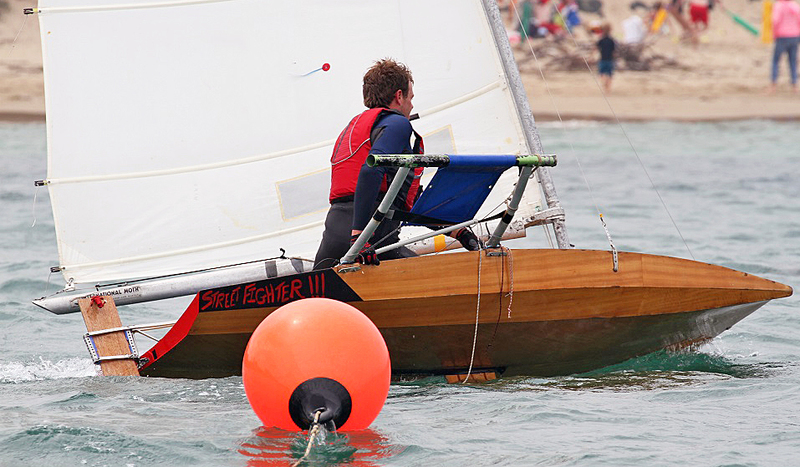 The 2016 Regatta was held this past January but I haven't received a report yet. When I do, hopefully I can post some photos. Oracle Team USA has been working steadily to bring the America's Cup to the attention of the masses. One part of that strategy is to publicly display the actual cup around the U.S. And there it was, tucked into a corner of the 2015 Annapolis Sailboat show, next to the old Fawcett building. As trophies go, impressive enough, very tall and ornate. After snapping a photo, I got a kick out of talking to one of the security contingent. He was dressed in a suit, sporting an ear bud, looking identical to the Secret Service, except for the white gloves. He was based out of San Francisco and when the America's Cup went out on the road, so did he. As security gigs go, this one didn't sound half bad. The security guys were amazingly tolerant about letting people close enough for group photos but physically touching the cup was a big no-no. 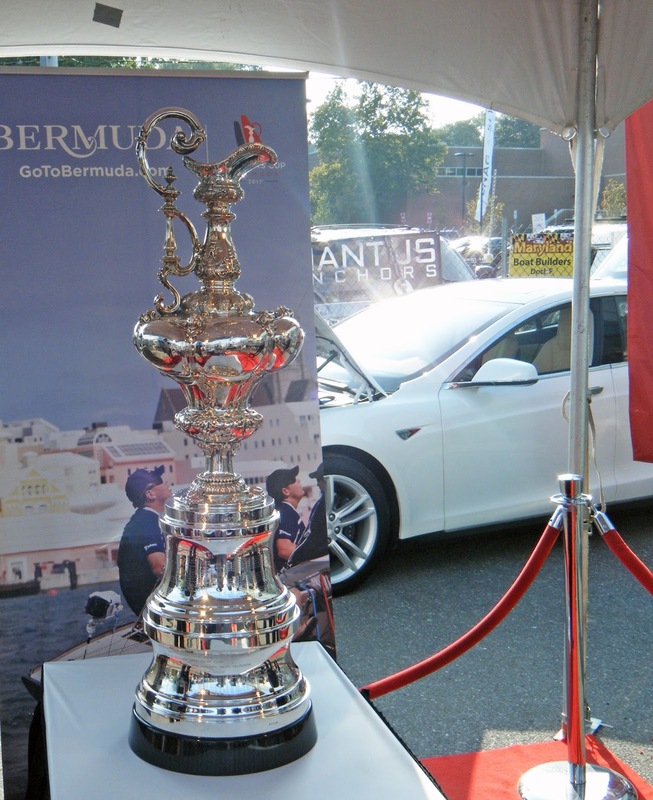 The car behind the America's Cup was one of the fancy Tesla E-cars, Tesla being one of the sponsors of the America's Cup tour. I took a look and, compared to our known fossil fuel vehicles , the Tesla was somewhat topsy-turvy. The powertrain and batteries were well hidden, out of sight, the front hood opening up to another storage compartment. One got the impression that the Tesla ran on some magical ether it collected from the air. I learned to sail, more or less, by myself; by taking out a small singlehanded pram, exploring the nooks and crannies of a river, enjoying the wind and water, no instructor in a coaches boat yelling in a bullhorn that I was doing this wrong or could I keep the boat a little flatter. 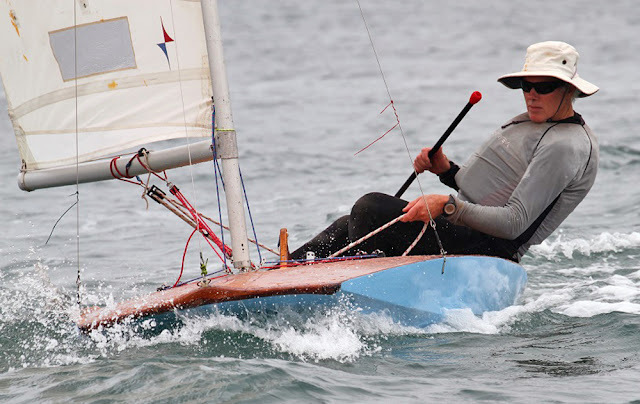 I have quite a few sailing friends (all accomplished racers) that learned outside a formal program. Unfortunately, what is lost in a junior sailing program is that confidence gained for a pre-teen in their first independent driving; by steering and handling the sails of a complicated piece of machinery, without an adult hanging over us, telling us what to do next. I'm sure that, going sailing by myself just racheted up the fun factor of sailing even more. I'm also thankful that my parents made sure I knew how to swim, was wearing a life jacket and were willing to let me push off in my 8 foot "yacht" as long as I was back by dinnertime. I have a soft spot for juniors who are learning on their own; maybe their form isn't quite right and they are capsizing right and left but, geez!, are they having fun. Exhibit A is the junior duo in this video making all the mistakes and grinning the whole time. I pulled this vintage photo off the Internet. The photo is obviously staged but does show a sailing day trip to the New Jersey bays. 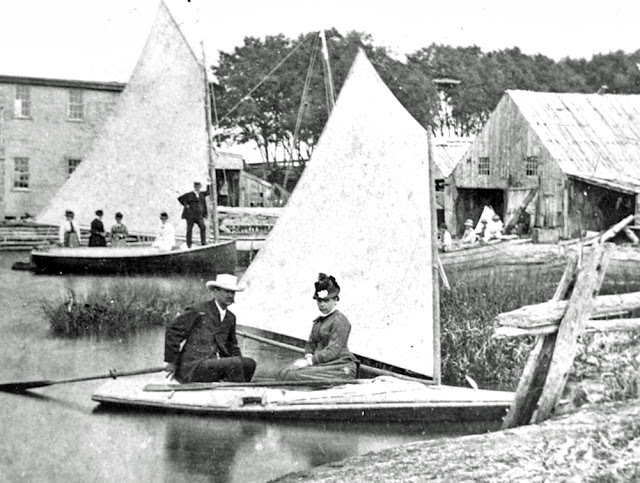 The growth of the railroads out to the New Jersey shore allowed the Philadelphia and New York crowd to enjoy day trips where local watermen would gladly take them out on "party" catboats, or if you were adventurous, you could rent out the smaller sneakbox for a sail. Date for the photo...my guess is the 1890's. No idea of the actual location.